After the article was published, an author, Catherine Parks, reached out to me. Parks co-authored a book with her mother about this very topic. 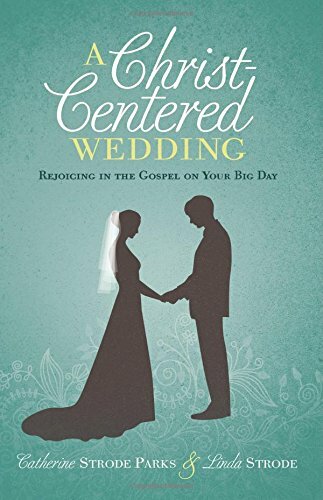 It’s called, A Christ-Centered Wedding: Rejoicing in the Gospel on Your Big Day. I just finished reading it last week. This has been my experience working with couples, too. There’s something in me, something ugly, that longs to preach Ephesians 5 better than it’s ever been preached: a sermon that engages the un-churched, dazzles the mature Christian, and rescues the estranged couple off the cliff of divorce. Each time I share a message in a wedding, it’s a little different. That’s because every couple is different. Below is the most recent message I shared at a friend’s wedding. In it, I talk about the difference between “consumer” and “covenant” relationships. I find this distinction to be a helpful way to explain the greater meaning of marriage. Anyway, the below message takes me about 8-10 minutes to share. I’m not sure it’s a “Pinterest dream wedding sermon,” but it’s what I’ve got for now. At this time, I’m going to share a few comments about marriage and about the gospel. These comments are for all of us, but I would especially like to share them with you, John and Jessica. I will say, though, that if you are here and you are not a Christian—perhaps you haven’t been to a church in a long time, or ever—you may be thinking, “I knew it; here it comes.” If that’s you, that’s okay. If I were you, I might feel that same way. However, I would encourage you to listen in because so often I find that what people think Christianity is all about, is really not what it’s about at all. And discussing for a few moments the deeper meaning of marriage might be a wonderful way for you to consider what it is that Christians actually believe, at least at the core of our faith. Marriage is, according to the Bible, more than a lifelong commitment to each other; it’s at least this, but it’s also more. Marriage is a reflection of what the Bible calls “the gospel.” And what I’d like to explain, just briefly, is how your marriage—and all marriages—are to reflect the relationship that God has with his people and God’s people have with him. A good way to do this is to talk about two types of relationships. I want to talk about “consumer” and “covenant” relationships. Just so that I’m not misunderstood, both types of relationships—consumer and covenant—have a proper place. Both can be very appropriate and healthy. A problem occurs, however, when we mistake a covenant relationship for a consumer one. To be more specific, the problem is when we mistake the covenant of marriage for a consumer relationship. But let me back up. When we talk about consumer relationships, what do we mean? They are one-sided relationships where, as long as the other person keeps doing his or her part, then we will do our part. We have these relationships all the time. For example, many times in the last two years, when John and I would meet to talk about life and pray for each other, we would go to either Starbucks or our favorite local coffee shop, Little Amps. These are different types of coffee shops, I know, but I like them both. But I’m in a consumer relationship with them both. If one of them stops “delivering the goods,” well, eventually, I’m going to stop going. The hallmark of a consumer relationship is that as long as they—the other person—holds up their end of the bargain, then I’ll hold up mine. If they change their product quality or if something happens, well, I’m free to do what I want; it’s my money. I was talking with my father last year, and he told me how recently, yet reluctantly, he changed his home and car insurance carrier after over thirty some years with the same company. There was an incident that made him change, which I won’t go into. But I bring this up because my father is the most brand-loyal guy I know. When he finds something he likes, he sticks with it. But even for him, even in his loyalty, his relationship with an insurance company is still a consumer relationship. And there is nothing wrong with that. Again, the problem comes when we bring this consumer view of relationships into marriage, which is to be a covenant relationship. A covenant relationship is not focused on whether or not the other person delivers the goods. No, a covenant relationship is one based on a solemn vow to hold up your own end of the agreement regardless of whether the other person does. This is the most beautiful of all relationships because it means that you can be truly known—known in all of your glory, but also known in all of your depravity and shame and failures and insecurities—and not only known, but still loved. This is the meaning of unconditional love: truly known and dearly loved. It’s God’s intention that marriage would be this type of relationship—one not based on what the other person does, but rather, through “better and worse, sickness and health, richer and poorer,” the marriage holds. So, what does this have to do with anything? Let me come back to where I started. John and Jessica, your relationship in marriage is a covenant relationship. It’s to be a place where you truly know each other and deeply love one another—unconditionally. And the reason that God has designed marriage to work this way is because it displays to the world the way God loves people in the gospel. This is the heart of Christianity. Christians do not believe that God loves us because we have done good; that would be a consumer relationship. Rather, at the heart of Christianity is the covenant love of God. The sad truth is that all of us, according to the Bible, are more like a faithless bride than a faithful one. Or to put it another way, we have spit in God’s coffee. And the gospel is the good news that, in Jesus, God has undertaken a rescue mission to win back his bride. It’s the good news that God sent his Son, Jesus, to do what we could not, would not, did not do. The Bible teaches that Jesus lived a perfect life; he was utterly faithful to God the Father, and loved him supremely. And then out of love for God, Jesus went to a cross and died, suffering the ultimate punishment for sin. Marriage is to display this. Specifically, you John, as a husband and based on the passage of Scripture just read (Ephesians 5:22-31), are to love Jessica as Jesus loves you: sacrificially and unconditionally. This is a high and honorable calling. And Jessica, your beautiful part is to represent the Church—the part of a loving, responsive, committed Church. Jessica, as an equal in person and value, you are to be John’s best friend and his most devoted helper, that together, you may accomplish the purposes of God, and in doing this, you will display to the world the beauty and blessing that it is for us, the Church, to follow God. You also have a high and beautiful calling. I want to end with this. Yes, you have your roles to play and yes, you ought to do them well, just as we all ought to do them, but you must remember something in the process: God loves you, both of you, John and Jessica. And though you will both inadequately display the gospel in your marriage, remember that you are not saved because you do right, but because God loved you even while you were at your worst, and he continues to love you. May this gospel of the covenant love of God be the centerpiece of your life together.